Drug design, often referred to as rational drug design or simply rational design, is the inventive process of finding new medications based on the knowledge of a biological target. The drug is most commonly an organic small molecule that activates or inhibits the function of a biomolecule such as a protein, which in turn results in a therapeutic benefit to the patient. In the most basic sense, drug design involves the design of molecules that are complementary in shape and charge to the biomolecular target with which they interact and therefore will bind to it. Drug design frequently but not necessarily relies on computer modeling techniques. This type of modeling is sometimes referred to as computer-aided drug design. Finally, drug design that relies on the knowledge of the three-dimensional structure of the biomolecular target is known as structure-based drug design. In addition to small molecules, biopharmaceuticals including peptides and especially therapeutic antibodies are an increasingly important class of drugs and computational methods for improving the affinity, selectivity, and stability of these protein-based therapeutics have also been developed. Molecular mechanics methods may also be used to provide semi-quantitative prediction of the binding affinity. Also, knowledge-based scoring function may be used to provide binding affinity estimates. These methods use linear regression, machine learning, neural nets   or other statistical techniques to derive predictive binding affinity equations by fitting experimental affinities to computationally derived interaction energies between the small molecule and the target. It has been argued that the highly rigid and focused nature of rational drug design suppresses serendipity in drug discovery. Because many of the most significant medical discoveries have been inadvertent, the recent focus on rational drug design may limit the progress of drug discovery. Furthermore, the rational design of a drug may be limited by a crude or incomplete understanding of the underlying molecular processes of the disease it is intended to treat . ^ Madsen U, Krogsgaard-Larsen P, Liljefors T (2002). Textbook of Drug Design and Discovery. Washington, DC: Taylor & Francis. ISBN 978-0-415-28288-8. ^ Ghasemi, Pérez-Sánchez; Mehri, fassihi (2016). "The Role of Different Sampling Methods in Improving Biological Activity Prediction Using Deep Belief Network". Journal of Computational Chemistry. 38 (10): 1–8. doi:10.1002/jcc.24671. PMID 27862046. ^ a b c Reynolds CH, Merz KM, Ringe D, eds. (2010). Drug Design: Structure- and Ligand-Based Approaches (1 ed.). Cambridge, UK: Cambridge University Press. ISBN 978-0521887236. ^ a b Fosgerau, Keld; Hoffmann, Torsten (2015-01-01). "Peptide therapeutics: current status and future directions". Drug Discovery Today. 20 (1): 122–128. doi:10.1016/j.drudis.2014.10.003. ISSN 1359-6446. PMID 25450771. ^ a b Ciemny, Maciej; Kurcinski, Mateusz; Kamel, Karol; Kolinski, Andrzej; Alam, Nawsad; Schueler-Furman, Ora; Kmiecik, Sebastian (2018-05-04). "Protein–peptide docking: opportunities and challenges". Drug Discovery Today. 23 (8): 1530–1537. doi:10.1016/j.drudis.2018.05.006. ISSN 1359-6446. PMID 29733895. ^ Shirai H, Prades C, Vita R, Marcatili P, Popovic B, Xu J, Overington JP, Hirayama K, Soga S, Tsunoyama K, Clark D, Lefranc MP, Ikeda K (Nov 2014). "Antibody informatics for drug discovery". Biochimica et Biophysica Acta. 1844 (11): 2002–2015. doi:10.1016/j.bbapap.2014.07.006. PMID 25110827. ^ Tollenaere JP (Apr 1996). "The role of structure-based ligand design and molecular modelling in drug discovery". Pharmacy World & Science. 18 (2): 56–62. doi:10.1007/BF00579706. PMID 8739258. ^ Waring MJ, Arrowsmith J, Leach AR, Leeson PD, Mandrell S, Owen RM, Pairaudeau G, Pennie WD, Pickett SD, Wang J, Wallace O, Weir A (2015). "An analysis of the attrition of drug candidates from four major pharmaceutical companies". Nature Reviews Drug Discovery. 14 (7): 475–86. doi:10.1038/nrd4609. PMID 26091267. ^ Yu H, Adedoyin A (Sep 2003). "ADME-Tox in drug discovery: integration of experimental and computational technologies". Drug Discovery Today. 8 (18): 852–61. doi:10.1016/S1359-6446(03)02828-9. PMID 12963322. ^ Dixon SJ, Stockwell BR (Dec 2009). "Identifying druggable disease-modifying gene products". Current Opinion in Chemical Biology. 13 (5–6): 549–55. doi:10.1016/j.cbpa.2009.08.003. PMC 2787993. PMID 19740696. ^ Anderson AC (Sep 2003). "The process of structure-based drug design". Chemistry & Biology. 10 (9): 787–97. doi:10.1016/j.chembiol.2003.09.002. PMID 14522049. ^ Recanatini M, Bottegoni G, Cavalli A (Dec 2004). "In silico antitarget screening". Drug Discovery Today: Technologies. 1 (3): 209–15. doi:10.1016/j.ddtec.2004.10.004. PMID 24981487. ^ Wu-Pong S, Rojanasakul Y (2008). Biopharmaceutical drug design and development (2nd ed.). Totowa, NJ Humana Press: Humana Press. ISBN 978-1-59745-532-9. ^ Scomparin A, Polyak D, Krivitsky A, Satchi-Fainaro R (Apr 2015). "Achieving successful delivery of oligonucleotides - From physico-chemical characterization to in vivo evaluation". Biotechnology Advances. 33 (6): 1294–309. doi:10.1016/j.biotechadv.2015.04.008. PMID 25916823. ^ Ganellin CR, Jefferis R, Roberts SM (2013). "The small molecule drug discovery process — from target selection to candidate selection". Introduction to Biological and Small Molecule Drug Research and Development: theory and case studies. Elsevier. ISBN 9780123971760. ^ a b c Yuan Y, Pei J, Lai L (Dec 2013). "Binding site detection and druggability prediction of protein targets for structure-based drug design". Current Pharmaceutical Design. 19 (12): 2326–33. doi:10.2174/1381612811319120019. PMID 23082974. ^ Rishton GM (Jan 2003). "Nonleadlikeness and leadlikeness in biochemical screening". Drug Discovery Today. 8 (2): 86–96. doi:10.1016/s1359644602025722. PMID 12565011. ^ Hopkins AL (2011). "Chapter 25: Pharmacological space". In Wermuth CG (ed.). The Practice of Medicinal Chemistry (3 ed.). Academic Press. pp. 521–527. ISBN 978-0-12-374194-3. ^ Kirchmair J (2014). Drug Metabolism Prediction. Wiley's Methods and Principles in Medicinal Chemistry. 63. Wiley-VCH. ISBN 978-3-527-67301-8. ^ Nicolaou CA, Brown N (Sep 2013). "Multi-objective optimization methods in drug design". Drug Discovery Today: Technologies. 10 (3): 427–35. doi:10.1016/j.ddtec.2013.02.001. PMID 24050140. ^ Ban TA (2006). "The role of serendipity in drug discovery". Dialogues in Clinical Neuroscience. 8 (3): 335–44. PMC 3181823. PMID 17117615. ^ Ethiraj SK, Levinthal D (Sep 2004). "Bounded Rationality and the Search for Organizational Architecture: An Evolutionary Perspective on the Design of Organizations and Their Evolvability". Administrative Science Quarterly. Sage Publications, Inc. on behalf of the Johnson Graduate School of Management, Cornell University. 49 (3): 404–437. JSTOR 4131441. SSRN 604123. ^ Lewis RA (2011). "Chapter 4: The Development of Molecular Modelling Programs: The Use and Limitations of Physical Models". In Gramatica P, Livingstone DJ, Davis AM (eds.). Drug Design Strategies: Quantitative Approaches. RSC Drug Discovery. Royal Society of Chemistry. pp. 88–107. doi:10.1039/9781849733410-00088. ISBN 978-1849731669. ^ Ghasemi, Pérez-Sánchez; Mehri, Pérez-Garrido (2018). "Neural network and deep-learning algorithms used in QSAR studies: merits and drawbacks". Drug Discovery Today. 23 (10): 1784–1790. doi:10.1016/j.drudis.2018.06.016. PMID 29936244. ^ Ghasemi, Pérez-Sánchez; Mehri, fassihi (2018). "Deep neural network in QSAR studies using deep belief network". Applied Soft Computing. 62: 251–259. doi:10.1016/j.asoc.2017.09.040. ^ Rajamani R, Good AC (May 2007). "Ranking poses in structure-based lead discovery and optimization: current trends in scoring function development". Current Opinion in Drug Discovery & Development. 10 (3): 308–15. PMID 17554857. ^ de Azevedo WF, Dias R (Dec 2008). "Computational methods for calculation of ligand-binding affinity". Current Drug Targets. 9 (12): 1031–9. doi:10.2174/138945008786949405. PMID 19128212. ^ Singh J, Chuaqui CE, Boriack-Sjodin PA, Lee WC, Pontz T, Corbley MJ, Cheung HK, Arduini RM, Mead JN, Newman MN, Papadatos JL, Bowes S, Josiah S, Ling LE (Dec 2003). "Successful shape-based virtual screening: the discovery of a potent inhibitor of the type I TGFbeta receptor kinase (TbetaRI)". Bioorganic & Medicinal Chemistry Letters. 13 (24): 4355–9. doi:10.1016/j.bmcl.2003.09.028. PMID 14643325. ^ Becker OM, Dhanoa DS, Marantz Y, Chen D, Shacham S, Cheruku S, Heifetz A, Mohanty P, Fichman M, Sharadendu A, Nudelman R, Kauffman M, Noiman S (Jun 2006). "An integrated in silico 3D model-driven discovery of a novel, potent, and selective amidosulfonamide 5-HT1A agonist (PRX-00023) for the treatment of anxiety and depression". Journal of Medicinal Chemistry. 49 (11): 3116–35. doi:10.1021/jm0508641. PMID 16722631. ^ Liang S, Meroueh SO, Wang G, Qiu C, Zhou Y (May 2009). "Consensus scoring for enriching near-native structures from protein-protein docking decoys". Proteins. 75 (2): 397–403. doi:10.1002/prot.22252. PMC 2656599. PMID 18831053. ^ Oda A, Tsuchida K, Takakura T, Yamaotsu N, Hirono S (2006). "Comparison of consensus scoring strategies for evaluating computational models of protein-ligand complexes". Journal of Chemical Information and Modeling. 46 (1): 380–91. doi:10.1021/ci050283k. PMID 16426072. ^ Deng Z, Chuaqui C, Singh J (Jan 2004). "Structural interaction fingerprint (SIFt): a novel method for analyzing three-dimensional protein-ligand binding interactions". Journal of Medicinal Chemistry. 47 (2): 337–44. doi:10.1021/jm030331x. PMID 14711306. ^ Amari S, Aizawa M, Zhang J, Fukuzawa K, Mochizuki Y, Iwasawa Y, Nakata K, Chuman H, Nakano T (2006). "VISCANA: visualized cluster analysis of protein-ligand interaction based on the ab initio fragment molecular orbital method for virtual ligand screening". Journal of Chemical Information and Modeling. 46 (1): 221–30. doi:10.1021/ci050262q. PMID 16426058. ^ Guner OF (2000). Pharmacophore Perception, Development, and use in Drug Design. La Jolla, Calif: International University Line. ISBN 978-0-9636817-6-8. ^ Tropsha A (2010). 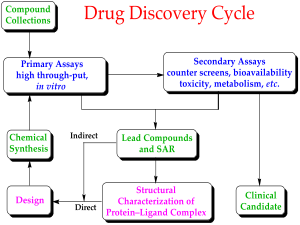 "QSAR in Drug Discovery". In Reynolds CH, Merz KM, Ringe D (eds.). Drug Design: Structure- and Ligand-Based Approaches (1 ed.). Cambridge, UK: Cambridge University Press. pp. 151–164. ISBN 978-0521887236. ^ Leach, Andrew R.; Harren, Jhoti (2007). Structure-based Drug Discovery. Berlin: Springer. ISBN 978-1-4020-4406-9. ^ Mauser H, Guba W (May 2008). "Recent developments in de novo design and scaffold hopping". Current Opinion in Drug Discovery & Development. 11 (3): 365–74. PMID 18428090. ^ a b Klebe G (2000). "Recent developments in structure-based drug design". Journal of Molecular Medicine. 78 (5): 269–81. doi:10.1007/s001090000084. PMID 10954199. ^ Wang R, Gao Y, Lai L (2000). "LigBuilder: A Multi-Purpose Program for Structure-Based Drug Design". Journal of Molecular Modeling. 6 (7–8): 498–516. doi:10.1007/s0089400060498. ^ Schneider G, Fechner U (Aug 2005). "Computer-based de novo design of drug-like molecules". Nature Reviews. Drug Discovery. 4 (8): 649–63. doi:10.1038/nrd1799. PMID 16056391. ^ Jorgensen WL (Mar 2004). "The many roles of computation in drug discovery". Science. 303 (5665): 1813–8. Bibcode:2004Sci...303.1813J. doi:10.1126/science.1096361. PMID 15031495. ^ a b Leis S, Schneider S, Zacharias M (2010). "In silico prediction of binding sites on proteins". Current Medicinal Chemistry. 17 (15): 1550–62. doi:10.2174/092986710790979944. PMID 20166931. ^ Warren GL, Warren SD (2011). "Chapter 16: Scoring Drug-Receptor Interactions". In Gramatica P, Livingstone DJ, Davis AM (eds.). Drug Design Strategies: Quantitative Approaches. Royal Society of Chemistry. pp. 440–457. doi:10.1039/9781849733410-00440. ISBN 978-1849731669. ^ Böhm HJ (Jun 1994). "The development of a simple empirical scoring function to estimate the binding constant for a protein-ligand complex of known three-dimensional structure". Journal of Computer-Aided Molecular Design. 8 (3): 243–56. Bibcode:1994JCAMD...8..243B. doi:10.1007/BF00126743. PMID 7964925. ^ Liu J, Wang R (23 March 2015). "Classification of Current Scoring Functions". Journal of Chemical Information and Modeling. 55 (3): 475–482. doi:10.1021/ci500731a. PMID 25647463. ^ Ajay, Murcko MA (1995). "Computational methods to predict binding free energy in ligand-receptor complexes". J. Med. Chem. 38 (26): 4953–67. doi:10.1021/jm00026a001. PMID 8544170. ^ Gramatica P (2011). "Chapter 17: Modeling Chemicals in the Environment". In Gramatica P, Livingstone DJ, Davis AM (eds.). Drug Design Strategies: Quantitative Approaches. RSC Drug Discovery. Royal Society of Chemistry. p. 466. doi:10.1039/9781849733410-00458. ISBN 978-1849731669. ^ Greer J, Erickson JW, Baldwin JJ, Varney MD (Apr 1994). "Application of the three-dimensional structures of protein target molecules in structure-based drug design". Journal of Medicinal Chemistry. 37 (8): 1035–54. doi:10.1021/jm00034a001. PMID 8164249. ^ Timmerman H, Gubernator K, Böhm H, Mannhold R, Kubinyi H (1998). Structure-based Ligand Design (Methods and Principles in Medicinal Chemistry). Weinheim: Wiley-VCH. ISBN 978-3-527-29343-8. ^ Capdeville R, Buchdunger E, Zimmermann J, Matter A (Jul 2002). "Glivec (STI571, imatinib), a rationally developed, targeted anticancer drug". Nature Reviews. Drug Discovery. 1 (7): 493–502. doi:10.1038/nrd839. PMID 12120256. ^ "AutoDock's role in Developing the First Clinically-Approved HIV Integrase Inhibitor". Press Release. The Scripps Research Institute. 2007-12-17. ^ Klein DF (Mar 2008). "The loss of serendipity in psychopharmacology". JAMA. 299 (9): 1063–5. doi:10.1001/jama.299.9.1063. PMID 18319418. ^ Ray, Amit. "7 Limitations of Molecular Docking & Computer Aided Drug Design and Discovery". Inner Light Publishers. Retrieved 21 Oct 2018. This page was last edited on 1 April 2019, at 07:21 (UTC).